IF YOU applied to be one of the bachelorettes on this year's season of hit TV show The Bachelor - and got rejected - you can stop crying into your half empty tub of Ben & Jerry's. There is no need to live vicariously through your TV screen any longer. Nick (The Honey Badger) Cummins is right here in Mackay! Well, sort of. Jack Simpson is a 21-year-old refrigeration and air-conditioning mechanic from Mackay who has an uncanny likeness to this year's bachelor, professional rugby union player Nick Cummins. "It's mainly on the weekends when I go out, and people come up to me and they just say 'you are the spitting image of him'," Jack said. "I just get approached straight away so I don't have to go out of my way to meet people. "It actually gets pretty full on sometimes because I'll be walking down the street and nearly every single person I walk past will say something. 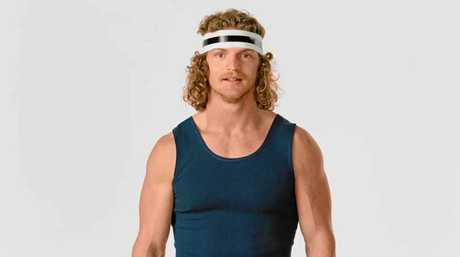 An Aussie icon, Nick Cummins, has been dubbed the Honey Badger because of his tenacious ability to play tough football against much larger opponents. The 'badger' is well known for his larrikin sense of humour, long curly hair and role as an ambassador for Tourism Australia. You might also recognise him from the many times he got his kit off for Tradie underwear ads ... he is the face (or should I say bum) of the brand. What most Mackay locals don't know - and quite frankly need to know - is that we have our very own Honey Badger doppelganger living amongst us. Jack was recently in Brisbane and actually got mistaken for the real Honey Badger. "Last time I was in Brisbane I confused a few people," he said. "I don't really see a huge resemblance myself but people who don't know me always comment on it." Ladies, before you get too excited, Jack is happily taken, so you might have to resort to watching The Bachelor on TV next week to get your Honey Badger fix. And try not to be too disappointed, there is always next season.